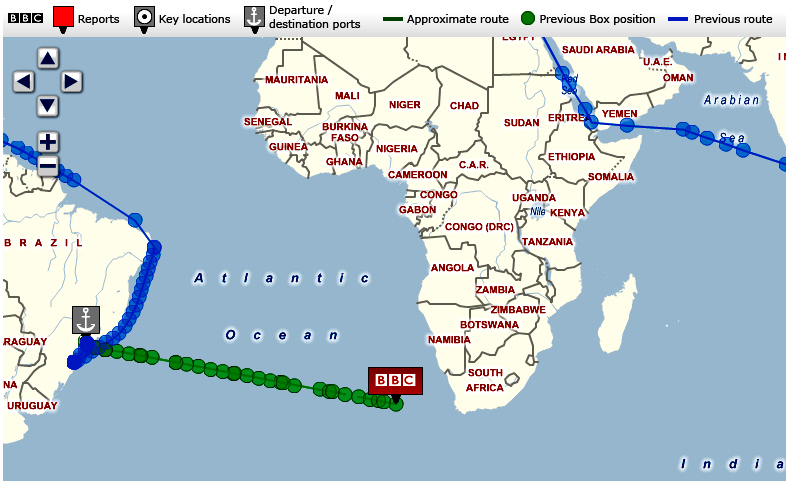 BBC News is following a container around world for a year to tell stories of globalisation and the world economy – track the BBC Box on a live updating map as it travels the globe. The Box is heading to Japan via the Cape of Good Hope and Singapore with a cargo of monosodium glutamate. In normal circumstances the location of the Box should be shown on the map, as transmitted from a Global Positioning System (GPS) unit attached to it. This might help you find out if it is in port and find where it’s docked – as the BBC haven’t given the name of the ship it’s currently on. It’s virtually impossible to get any where close to the ship to look for the container let alone to photograph it! The Red Box’s GPS location on 28th March @22:28 – Green dots show the GPS readings with the time and contents in pop up box, when you hover over them – exciting stuff! What’s in the red box? STOP PRESS! BIG Whoops – Green dots misleading! Rats! The BOX has sailed right past Cape Town! The GPS dots on the map really looked like they were B lining into port!